Have you spent months staring at a stack of Serum 207s which you just can't be bothered to drop one-by-one? Perhaps your bank is in need of a big clean up but you simply don't have the time? Well, we've got the update for you! If you've ever wanted a quick way to clear out items from your bank, we've got a treat for you. 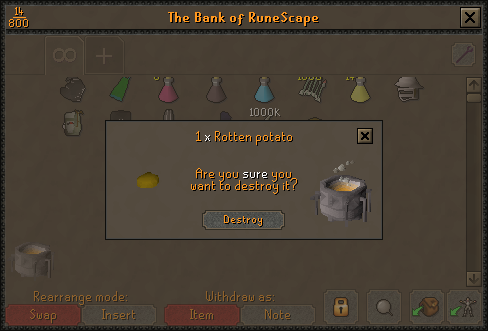 The item incinerator can now be toggled on inside your bank for the quick disposal of items! 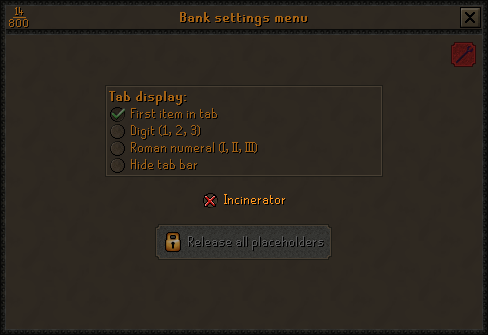 To toggle your item incinerator on, click the settings button found in the top right corner of the bank interface and click the new item incinerator option. Following this, a new icon will appear in the bottom left of your bank interface. This is the item incinerator. To incinerate a stack of items, simply drag it over the item incinerator icon and release your mouse button. You will be asked to confirm the incineration of your items. Once you confirm you would like to destroy your items and click the destroy button, your selected items will be permanently deleted. Items which are incinerated are permanently destroyed. Be very cautious when using this feature and always double check what you are incinerating. Also, keep in mind that the item incinerator destroys entire stacks of items, not just one from a stack. Players have commented that the incinerator makes it easier for a hijacker to destroy your items. This isn't new, however, as anyone who got past your Bank PIN would already have had access to steal or remove your stuff; you could hardly rely on them to get bored before they did anything spiteful! We recommend very strongly that you make sure you've got a secure password and Bank PIN. You should also enable the RuneScape Authenticator for your account - preferably using a separate device to generate its codes - and ensure the email address you're using is properly secure too, such as via two-step verification. Previously, the items you keep on death were chosen based on the high alchemy value of your items. This often led to players losing their most valuable items in place of lower value items which hold a higher alchemy value. Items kept on death are now decided based on Grand Exchange value. An example of this in action can be seen below. Previously, the robin hood hat would have been lost due to its alchemy value being lower than that of the rune items. However, with this change in place, the robin hood hat is kept on death due to its greater Grand Exchange value. 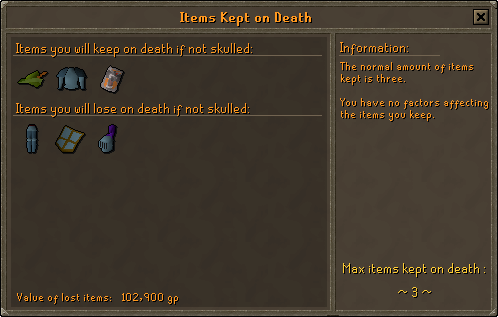 The items lost on death screen, accessed via the equipment tab, shows you which items you are risking as well as their estimated Grand Exchange value. Please note: untradeable items have been given estimated Grand Exchange values, meaning it is possible for them to be kept instead of tradeable items on death. Be sure to check your items lost on death screen before risking any equipment, untradeable or otherwise. It is also worth noting that the temporary death mechanics, providing an extended period of time to retrieve your items and the protection of untradeable items, are still in place. We will be sure to give plenty of notice before these mechanics are changed. Adventurers brave enough to take to the deep wilderness with amulets of glory in hand now stand a chance at getting something rather special. There is now a 1 in 25,000 chance of receiving an amulet of eternal glory when charging the amulets at the Fountain of Rune. The amulet of eternal glory works just the same as your usual amulet of glory, however it has unlimited charges. The amulets will be very hard to come by, and will require substantial risk to obtain. If you are interested in one of these amulets but you don't fancy risking your bank to get one, you'll be able to purchase one from another player. If you're feeling brave and want to try your luck at the Fountain of Rune, now is the time to do it! It is now possible to choose the value at which alchemy warnings appear by right-clicking the alchemy spells in your spellbook tab. The Ring of Suffering can now be imbued at the Nightmare Zone to double its stats. When reporting players, it is now possible to add them to your ignore list by checking a box found on the report interface. Farming shops now sell Compost packs. The Midsummer event has now been removed and will return again next summer. Abyssal Demons have had the abyssal dagger added to their drop table with a drop rate of 1/32k. Bind and Freeze effects in Castle Wars do not carry on past death. Burying Lava Dragon bones in Lava Dragon Isle now gives a 3x experience multiplier rather than 2x. Wild dogs in Brimhaven Dungeon no longer see you as a threat. Zombies found on Harmony will no longer be aggressive to players who have completed the Great Brain Robbery. Gilded boots have had their model tweaked to be completely gold. Bridges in Trouble Brewing minigame are once again flammable. Pets with multiple forms now share a bank placeholder with each other. Dorgesh-Kaan chests can now be picked as expected when carrying a hair clip as well as a lockpick. Heroes’ quest has been made slightly more clear. Anyone who was confused should now find Straven is a little more informative, and the quest journal more useful. The location of the lyre when equipped has been adjusted to suit the character better. It is no longer possible to cast alchemy spells on the Progress Hat. Resolved an issue where the Dark Mage was not repairing some player’s Rune Pouches. A graphical error when a male character has the Armadyl Chestplate equipped has been fixed. Corrected some spelling in dialogue with the Overseer. Corrected some spelling on the bone key examine text. Eric on Jatizso will now correctly address players based on their gender. Added the motherlode mine to the mining skill-guide. Tribal masks are now listed with the correct names in the Costume Room. The delay before you can eat food after closing the bank in Deadman Mode has been reduced. Fixed an issue where a small area of Varrock Castle wasn't guarded in Deadman Mode. Alchemy spells can no longer be cast in Pest Control. Could we please have an option to receive un-noted Lava dragon bones if we've completed Wilderness elite diary? I noticed that the the delay being removed from lunar spells the last update has (before this patch) been silently reverted? Why is this? At least, from spellbook swap spell it has been. Very nice update. Love the idea of the incinerator. Of course you make compost packs buyable now that I just ran back and forth buying them for Hosidius rep... it is going to take awhile to adjust to the new items kept on death but that has been an update that should have been implemented back in RS2. All in all amazing QoL update. Thanks ! Thank you very very much for fixing the bug with the bridge burning at Trouble Brewing. Things will be much more interesting now <3 .